Happy to return, defensive lineman Karl Klug is anxious to remain disruptive for Titans. NASHVILLE, Tenn. – Defensive lineman Karl Klug and his wife, Stacy, had their hands full on Friday. 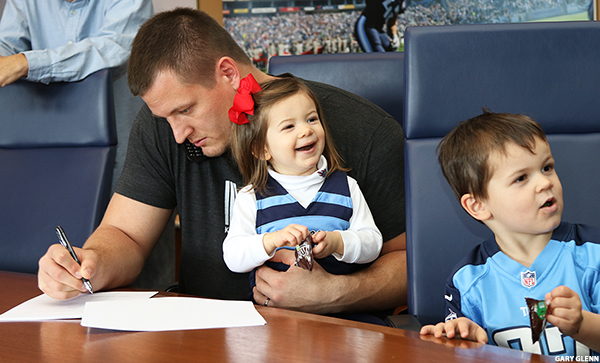 As Klug signed his new deal with the Titans, his young son, Rylan, scrambled for fallen M&Ms. He maneuvered around the conference room at Saint Thomas Sports Park, sometimes walking, sometimes crawling. He occasionally barked (Rylan, not Karl). Cora, the couple’s young daughter, played with magnets. It was all hands on deck for the Klugs, and baby No.3 is not too far away. The Titans like Klug because he’s a handful for offensive linemen, and once again he’s been rewarded for it. “I am real happy,’’ Klug said after inking the deal. “The people around this building are great, and to be able to spend hopefully another two years here, it is great. So that is what we are looking forward to, not having to move. On the first day of free agency, the Titans agreed to terms with Klug, a dependable veteran who has been a consistent performer with the team. Klug initially joined the Titans as a fifth round draft pick in the 2011 NFL Draft. He’s known for his no-nonsense approach, and rugged style of play. It’s made him popular with teammates, coaches and fans. Klug said he’s been impressed with the direction of the franchise. The Titans finished 9-7 last season after winning just five games over the previous two seasons. Klug said he also likes the way he’s recovering from last year’s Achilles injury. Klug played in 14 games last season, and finished with 25 tackles and 1.5 sacks. He suffered a season-ending Achilles injury on December 18 at Kansas City, and had surgery. Klug got out of the walking boot on Thursday, and he’s making great progress, he said. “I am moving around even better than I was yesterday,’’ Klug said. “So I am making progress, and it sounds like camp is going to be a go. So now I just have to put the work in to get ready.